I've made another garment as a Britex blogger. You can see the post on their blog here. I love the texture of a pebbled crepe and this fabric came through the washer and dryer like a champ. I wanted to sew it into harem pants, but I could also see this as a stunning kimono jacket. The fabric resists wrinkles and would be great for travel. 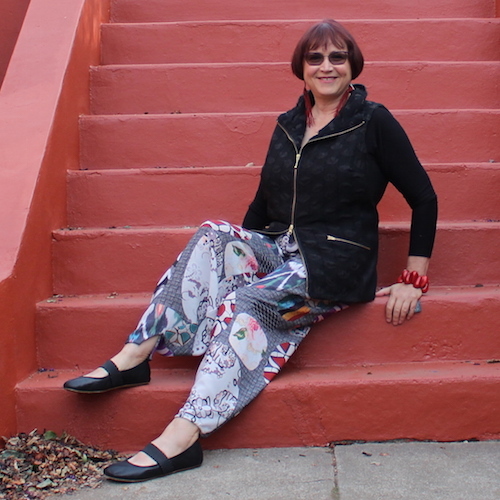 I decided to use Sandra Betzina's harem pant pattern, Vogue 1355. 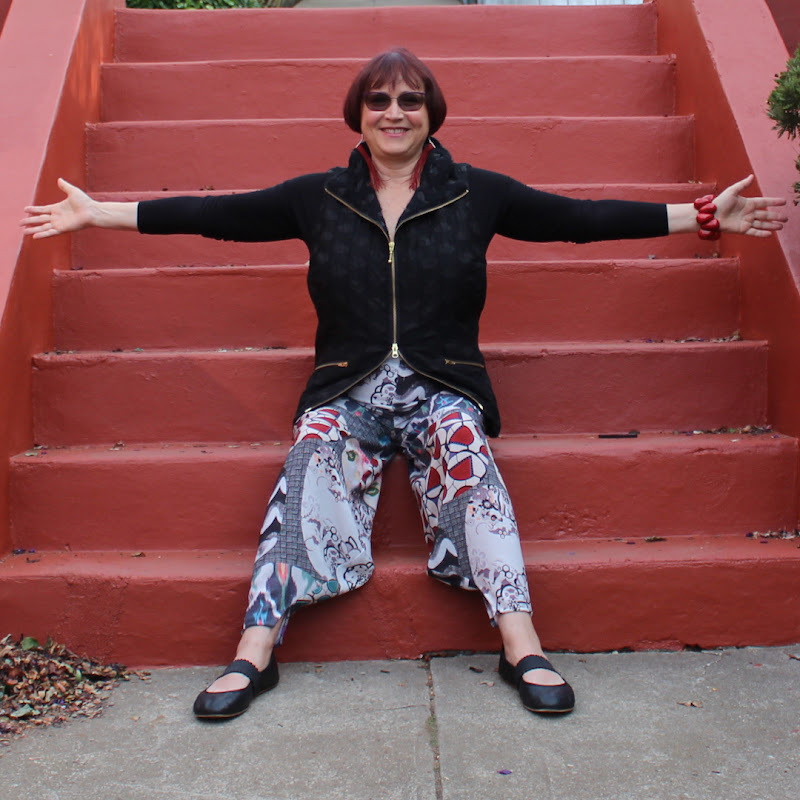 This harem pant is unusual in that it is close-fitting through the crotch. The fullness is located on the inside leg, not at the outer hip. It is designed for a knit fabric, not a woven, but this fabric has such a wonderful drape that I forged ahead. I made a few changes. 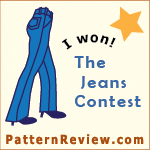 The pattern uses 2 pattern pieces: one for the leg (this is a no-side-seam pant) and one for the yoke. I omitted the yoke and extended the rise of the pant. The ankle of the pant is quite narrow. I realized it would be too narrow in a woven fabric to get my foot through the opening. I was considering shortening the pant slightly to remedy the problem but, in the end, I really liked it finished with a slit at the inside ankle. 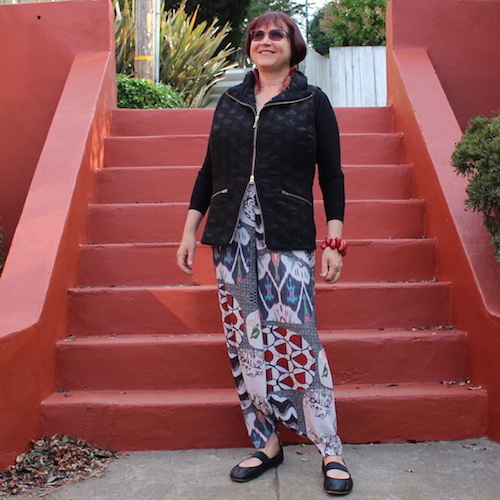 The best thing about these pants, besides the fun print, is that they were a quick sew! Just one pattern piece (after my alterations) meant that I was quickly done. Thanks to Britex for the fabric! I love these pants on you! I have admired this pattern for a while and it's fun to see it made up. Your change to the hem is just right. They look like a super comfortable pair of pants and fun too. Anna, I wore these all day at Artistry in Fashion. It was a hot day and I was SO comfy! You look better in harem pants than anyone else I've seen. Making them from glorious fabric shows your highly individualistic talent. Wow, Carol. 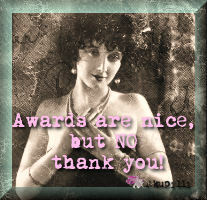 Thanks for that high compliment! 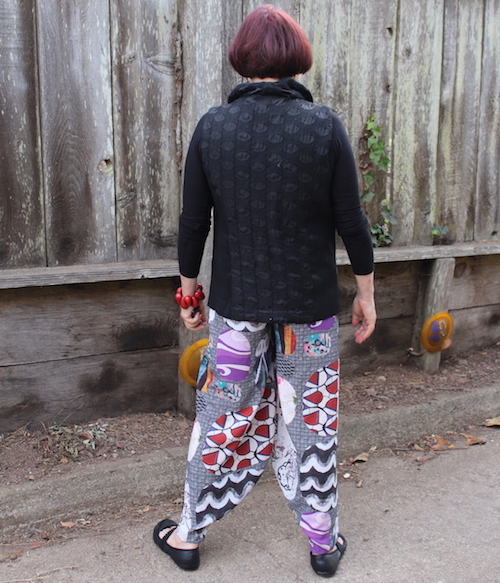 I would love this fabric in a kimono but your pants are flattering and unique. Cool! It would make a to-die-for kimono, Jane! Thanks! Thanks, bmgm! I hope you are doing well off in the Rockies! I am too conservative in my trouser choices, I really should try some of the amazing trouser shapes that you show. 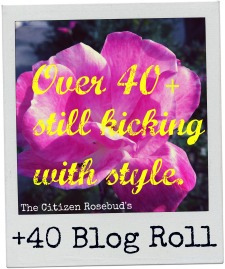 These are no exception to your fabulous, quirky choices and they look wonderful. 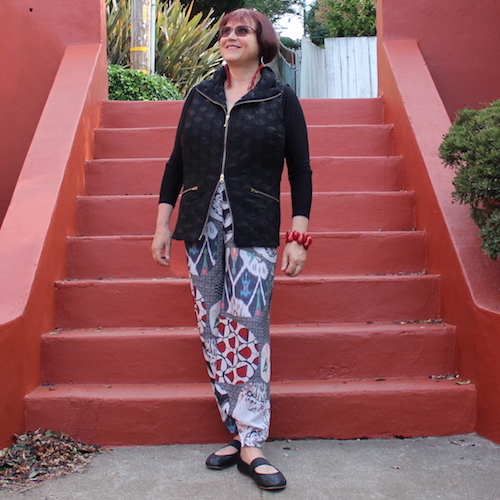 these harem pants look so cute on you! Thanks, Heather! This is definitely not priced like an average polyester, but it is not your usual polyester! I saw these at AIF! This is Rebecca, I introduced myself to you on Saturday, I live in Berkeley, and I love love love your work. I sewed a lot as a teenager, took a many-years-long break, and am now committed to being a sewist again. Love the pants! Hi Rebecca! It was nice to meet you, but it was too bad you couldn't join us! Really cute! As always, you turn the most incredible fabrics into perfect for you garments. They totally evoke your style. Thanks so much, Bunny! That is high praise, indeed! I really admire how you take interesting fabrics and turn them into garments that I would never conceive and make them look fabulous and true to your style. The light color and pattern is perfect for balancing your figure. Just wonderful! Thanks for that high praise, Unknown! 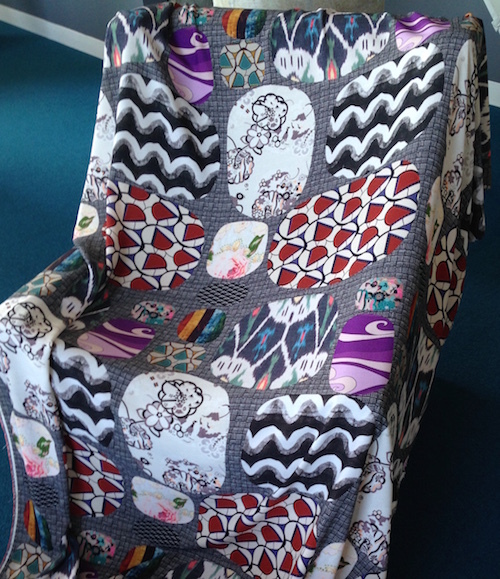 A work of art - ingenious use of the fabric. These are just so cool. The fabric and pattern seem to go together perfectly, to my eyes, and you wear them well. Perfection! I agree with all the comments; the harem pants are fantastic. But $89.99/yd! 2.5 yds to make these pants -$225. Out of my budget! Too cute for words! If I saw you on the street and didn't already know you I'd run over to say hi! Great choice. I love the crepe no wrinkle part. Does the fabric breathe? I am late to notice this post, but I am gob-smacked! 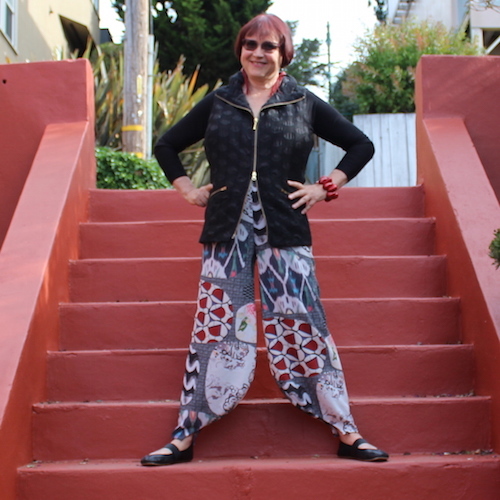 I could totally see myself wearing these harem pants because of the way they are designed with the higher crotch and the slim silhouette on the outer legs. Thanks for bringing this pattern to my attention! And the fabric - to die for. And finally, the way you styled the outfit is perfection. Finally, finally - super photos. I love you against those red stairs. Well done! well done. This harem pant looks so cool. It is Multi-color and different patterns and that's why it looks more attractive and stylish. Nice look. Thanks, Angela! I love using bold fabrics with this pattern!